The Institute for Cultural Diplomacy has developed the program “Experience Africa” to promote social and economic development within Africa, and to strengthen relations between cultural groups and nation states on the continent. At the global level, the program works to promote stronger political, economic, and cultural links between Africa and other regions. The ICD has established the “Experience Africa” program to ensure that the challenges outlined above are addressed, and the opportunities seized. To promote social development in Africa, in particular in the fields of education and healthcare. To strengthen relations between nation-states and cultural groups on the African continent. To foster stronger relations between African and other regions of the world. To encourage economic investment in, tourism to, and trade with, Africa. To improve relations between African Diaspora communities. The role of the African Union in promoting economic and social development, and as a regional peacemaker. The success of aid and development programs in achieving their objectives. The development of tourism in Africa over the coming two decades. The role of national brands in promoting international investment and tourism in Africa. Micro financing and the emergence of new development initiatives in Africa. 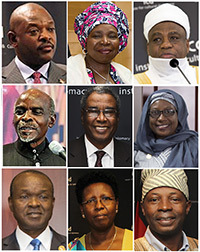 The role of the global African Diaspora in promoting development and stability. The development of China-African relations and their importance to both regions. The roles of cultural diplomacy and soft power in the foreign policies of African states and the region as a whole. The use of music, art, and sport, to promote stronger intercultural relations within Africa. The European Union as a possible model for the African Union. CDA brings together students and young professionals from across the African continent, and the wider international community, for weeklong study tours in Berlin, London, or Brussels. The study tours provide the participants with an opportunity to learn more about salient political, economic, and cultural issues concerning the African continent and its position in the world. In addition to academic components, participants take part in a diverse range of cultural and social activities that provide them with an opportunity to expand their personal networks and experience the cities remarkable cultural landscape. The Experience Africa program will host a diverse range of conferences, lectures, and panel discussions. These events will take place around the world and, open to the public free of charge, and will play a key role in raising awareness of the key perspectives on the academic themes outlined above. These events will feature high profile speakers from academia, international politics, diplomacy, and civil society, ensuring a thorough, interdisciplinary analysis of the subjects. As an organization working to strengthen intercultural relations, the ICD will conduct and publish relevant academic research into the academic themes outlined above. This research is conducted by the ICD staff and Advisory Board, members of our international network, and other key program stakeholders. All research material is presented at our events.